What does it cost to rent a tuxedo? Prices start at $89.00 with promotion. Price includes jacket, pants, vest or cummerbund, shirt, bowtie or neck tie, suspenders, cufflinks, studs, pocket square alterations and dry cleaning. When can I pick up my tuxedo? On your assigned pick up date, after 6:00 p.m., which is usually three days prior to your function. We rent and sell new and used men's and boy's tuxedos and accessories. We also have a variety of men’s apparel available for purchase including CALVIN KLEIN. Why have a Black Tie Wedding? Your ceremony and reception will definitely be more exciting and you'll treasure the photos of you, your family, and friends – remembering what a truly beautiful and special day everyone experienced – for years to come. What happens if the tuxedo doesn't fit? We do offer a three day prior fitting, at which time minor alterations will be done on the spot and any replacement is guaranteed for the following afternoon. We strongly suggest that everyone renting is present at this scheduled fitting to ensure a proper fit with ample time. What do I do about out of town ushers? We specialize in formalwear, however, we do carry three suit lines in black, tan and grey. Do you sell used tuxedos? Yes, we sell used tuxedos and the price will vary according to size, style, availability and condition. We also sell new tuxedos starting at $249.00. We accept Cash, Visa, Master Card, American Express, and Direct Payment. We do not accept cheques. Can I buy the tuxedo I am renting? It is possible to purchase the tuxedo you are renting. Should you decide to purchase prior to the rental, your deposit will be applied to the purchase price. Should you decide to purchase after, a portion of your rental charge will be applied to the purchase price according to style, size and availability. Do you carry boys tuxedos and how much do they cost to rent? Yes, in all our styles at 10% less, starting at $81.00. If you gain/lose more than 10 lbs. we suggest you be re-measured 3 weeks prior to your final fitting. Why is there a $9.00 waiver and do we have to pay it? The waiver covers any unintentional damages and/or stains that occur while in your possession. If you do not pay the waiver, you will be responsible for any damage. Should I wear a tuxedo for my second wedding? Yes, it's just as important to look your best for your special day as it was for the first. Unparalleled Selection & Style No other formalwear store offers a wider selection of tuxedos and accessories in the latest styles, colours, fabrics and designers for your wedding or special occasion. 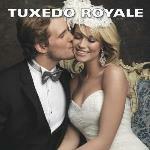 The Best Reasons to shop Tuxedo Royale: for 2013 No Extra Charge for Vests & Pocket Squares Complete Packages. 190 colours of accessories to choose from. Formalwear to suit every budget starting at $89.99 with promotion. Complimentary try-on for the groom. See, touch & try on garments before you buy or rent. No need to order from a catalogue. Home of the best price guarantee. We will match competitors' prices. Out of town measurements can be arranged. Sizes from boy's 3 to men's 72. Boys tuxedos available at 10% less. Providing designer brand formalwear for over 30 years. Full display in all locations. Convenient location with lots of FREE parking! Formalwear is our business, not a sideline! Proudly Canadian owned and operated. You deserve the very best!